According to Ayn Rand, “You can choose to ignore reality, but you can't ignore the consequences of ignoring reality.” Most of us rely heavily on the media for information, not realizing that 90 percent of it is controlled by a mere six media giants. "It couldn't be farther from the truth, the idea that we had been shot up by sniper fire," Sharyl says. "There are a couple of choices – just being untruthful for her own benefit, or was she delusional, which is a little frightening. But I think the public got past that because they accepted her as the Secretary of State." Hallmark signs of astroturfing include using key language—words such as crank, crack, nutty, pseudo, conspiracy, and other language that's effective with the public to try to make you dismiss an argument they don't like. Another hallmark of an Astroturf campaign is attacking those who are questioning authority, such as reporters who are exposing the truth, whistleblowers who dare to step forward, and people asking tough questions. A perfect example of astroturfing just occurred when a GMO front group attacked Dr. Oz after he reported on the now scientifically established hazards of glyphosate, and the media swallowed and regurgitated the propaganda without any critical thought whatsoever. Slate magazine publicized the attack with the headline "Letter from Prominent Doctors Implies Columbia Should Fire Dr. Oz for Being a Quack." The letter accuses Dr. Oz of repeatedly showing "disdain for science and for evidence-based medicine, as well as baseless and relentless opposition to the genetic engineering of food crops." The letter was signed by Dr. Henry I. Miller and nine other "distinguished physicians." What the media has failed to address is that Dr. Henry Miller is hardly a concerned physician. He's actually a now well-known shill for the GMO industry. "One was stripped of his medical license in New York and sent to federal prison camp for Medicaid fraud. Yet Dr. Gilbert Ross plays up his M.D. credentials in his role as acting president of the American Council for Science and Health (ACSH). Ross was joined on the Columbia letter by ACSH board member Dr. Jack Fisher. These facts are relevant in stories about scientific integrity. The scientific accuracy and motivations of the accusers matter when they are publicly challenging the scientific accuracy and motivations of somebody they are trying to get fired. We urge reporters and editors to take a closer look at the sources selling them story ideas, and to act as better watchdogs for the public interest". Indeed, Henry Miller and ACSH are false fronts for the GMO industry, plain and simple. They are part of a PR hack strategy of astroturfing, and the mainstream media are too inept to look behind the curtain to see what's really there. 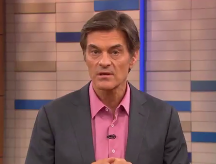 The fact of the matter is that this attack on Dr. Oz is orchestrated not by concerned physicians or scientists but rather by industry shills whose job it is to attack anyone who embraces a more natural approach to health and/or raise damning questions that might hurt the industry's bottom-line. "There's a story in my book about former executive producer of mine who got a phone call from the sales division, which was very inappropriate. He said the sales person from CBS was kind of screaming at him because we'd been doing a lot of stories looking at side effects and problems with the very popular and billion-dollar-selling cholesterol-lowering drugs, statins. And you won't see these stories now even when there's a multi-billion-dollar criminal settlement against drug companies for mismarketing drugs that are commonly used. That's a huge story that should be leading the news in my opinion. But most people probably never heard of it because those are things that offend the sensibilities of advertisers, who now control to some degree the editorial content of networks, publications, and print publications that are advertising. "Too often reporters wait for the government to tell them what's a story and what's not a story. They won't do the digging on their own, which I think is a very bad trend. But I tried to find out about this [enterovirus] and asked the CDC some questions, to which they replied they didn't gather certain data. I searched the web and found that the CDC had published a paper with the data that I've asked for! So it was completely false what they told me..."
They were just told that this treatment would be good for their baby. In reality, the babies were randomly placed into high-oxygen or low-oxygen groups—not what was best for them individually. The parents were unaware that their child was being given treatment based on the flip of a coin. The parents also didn't know that their child was placed in an oxygen machine that had been disabled to give false readings. Another story Sharyl believes has been underreported is that of HealthCare.gov. "The US government is still hiding public documents that have been under the Freedom of Information Act (FOIA) for a long time," she claims. And the media simply reports whatever the government says, even though the government has been caught providing false information, including providing false statements under oath to Congress. There are still details of this health care program that we don't know anything about, and why is that? In her book she also exposes the debacle of how HealthCare.gov was developed, so if you're interested in learning more about that, please pick up a copy of Stonewalled. Sharyl has donated proceeds from Stonewalled to the University of Florida to put on a Freedom of Information forum for students and professionals, in which they brainstormed to come up with ideas for making the government more responsive to public information request; how to fix the freedom of information process, "which is entirely pointless and useless now," as Sharyl says.